I have very fond memories of growing up in an Italian family. I am sure that most, if not all of you, have similar memories. They are warm and comforting. More often than not they take place when you were a child. And even more specifically, they most likely centre on your mother and her kitchen. 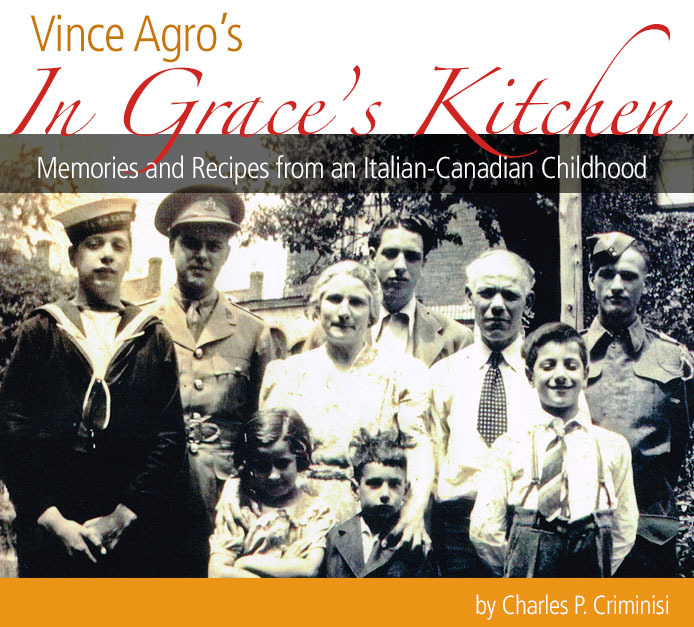 These types of memories are conjured by Vince Agro, in his new book In Grace’s Kitchen: Memories and Recipes from an Italian-Canadian Childhood, the much anticipated follow up to his critically acclaimed The Good Doctor. In elegant prose Agro takes us back to his childhood with particular focus on his beloved mother Grace, and her kitchen. When reading this book you feel as though you are there with them. You feel the steam rising from the pot, the anticipation of family and friends gathering around the “centrotavola,” and the flow of conversation before, during, and after the meal. Photograph: Naval Cadet Steve Agro, Captain Doctor Charles Agro, Grace Agro, Joe Agro, Sam Agro, Louis Agro and Lieutenant John L. Agro. Jenny Torone and Vince Agro stand in front of Grace.